Anyway, Nadler is not all Likkudnik. No, he doesn’t actually do legislation, as we noted before. But he does do community service. Here’s a letter he sent his constituents today. See the date. If you click on the image you can enlarge it to reading size. You will that the issue is the closing of a major post office facility in his district. He sees this as a major inconvenience to his constituents. And, worst of all, they gave almost no time for public comment. Fortunately, Congressman Nadler had the period for comment extended. 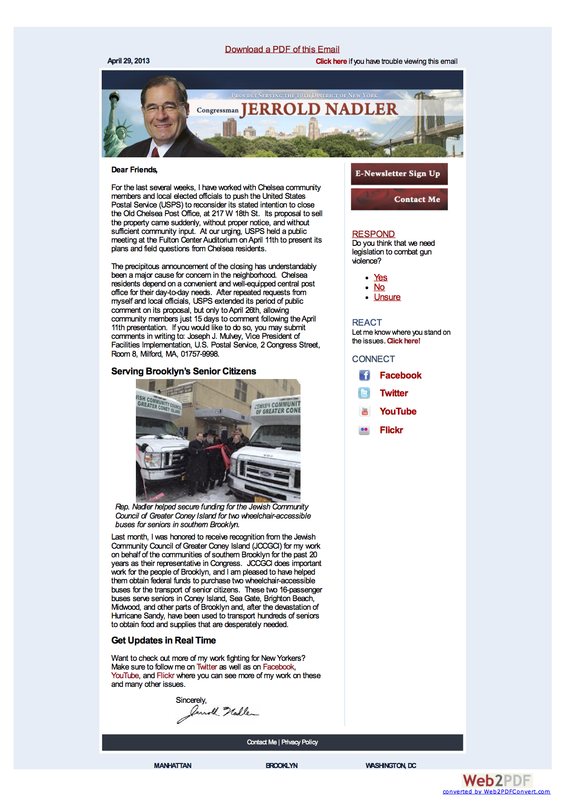 But in this April 29 email, he urges his constituents to send their comments by the new deadline he engineered—April 26. Having handled constituent services like a New York City progressive, we can all sing “Happy Days are Here Again,” and he can go back to his real job, supporting illegal settlers in territories Israel occupies.